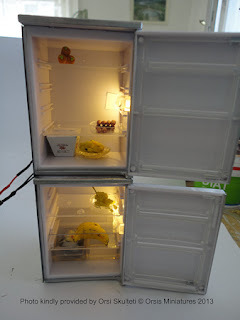 A few weeks ago I was asked about using LEDs for a 1/12th scale kitchen room box scene. 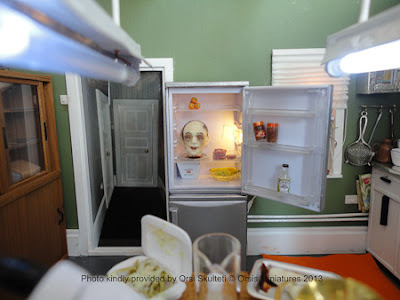 Orsi from Orsis Miniatures wanted LEDs for tube lights in the ceiling and under the kitchen cabinets, false daylight in a window and lights in a fridge. LEDs are very useful in a kitchen and there's a few ways they can be used. The photos below show some options. Other options for ceiling lights would be to use standard 3mm LEDs as ceiling spot lights or down lights with either clear lens clips or metal eyelets as holders. You could also have a hanging 3mm LED with a lampshade. Nano chip LEDs can be used in any appliance from a microwave to an oven. 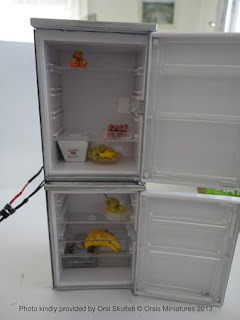 Because they are so small but very bright they are the perfect way to bright your appliance to life without it being obvious you have installed a bulb or it getting in the way. All the LEDs can be run off a 3v compact AAA battery holder. I advised on colours and types of LED for each light, creating a bespoke solution with thin wires so she could fit the LEDs through the thin brass tubes for the ceiling lights. 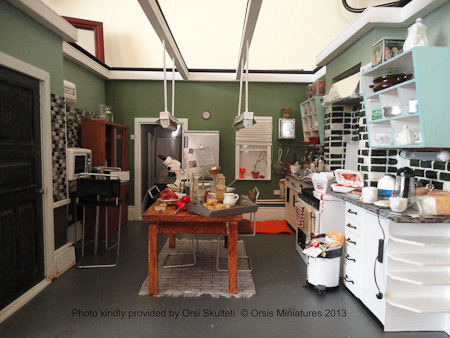 Orsi recently sent me photos of her finished scene. 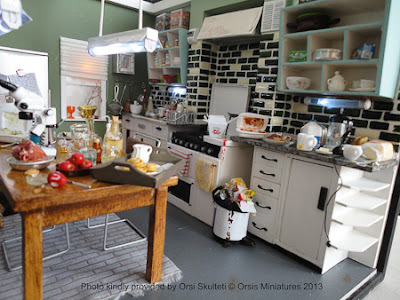 As it turns out, it was a commission to make a recreation of the kitchen from the BBC TV series "Sherlock" and I'm sure you'll agree that the detail is stunning. If you would like to create some similar effects in your own kitchen you can either e-mail me to discuss options or you can buy the LEDs on my website.